Feijoa season is, in my opinion, one of best thing about autumn. 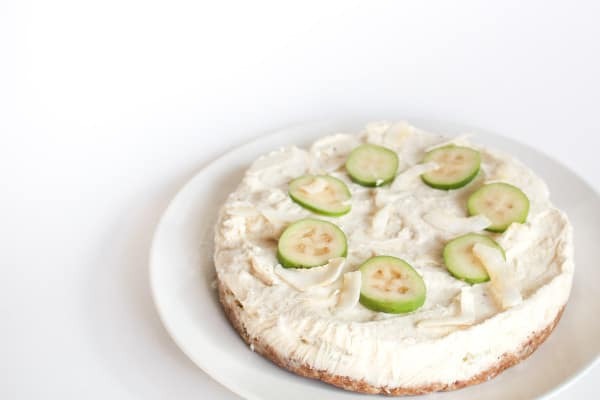 As well as eating these in abundance, I’ve created one of my one of my favourite recipes so far, a feijoa cheesecake. We’ve got four feijoa trees at home, and while they are still small they have produced plenty of fruit. I think the fact that feijoas are only around for a few months a year makes them even more desirable. These sweet, tangy fruits are also known as the pineapple guava and are a source of vitamin C, potassium and soluble fibre. This cheesecake cuts down on the cream cheese (1 tub instead of 2-3) and uses Greek yoghurt to create a lighter yet delicious taste and texture. 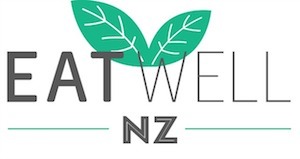 It’s sweetened naturally with the feijoa and a little honey, although you can use any sweetener you wish. The base is made with wholesome ingredients instead of the standard biscuit base in traditional cheesecakes. I’ve included two versions for the base, because I ended up making two feijoa cheesecakes to get the filling right and thought I may as well test a new base recipe. I think I may prefer the oat one, but choice is yours. 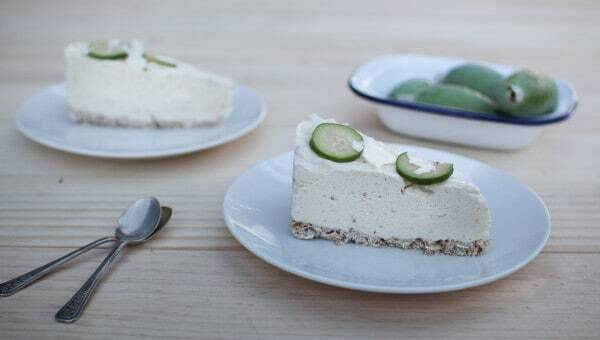 Enjoy the feijoa cheesecake while the feijoa season lasts. You could even have my feijoa ice cream with it too! Blend the mixed nuts in a food processor until the nuts are finely chopped. Add the remaining ingredients and blend until the mixture is well combined. Place a piece of gladwrap inside a 20cm round tin so it comes up and over the edges. This makes it easy to pull the cheesecake out. Alternatively, you can use a spring bottom tin. Press the base mixture into the bottom of the tin. Take the feijoa flesh and blend up in a blender until it is a liquid. Set aside. Place the cream cheese in a medium sized glass bowl and out at room temperature to soften for an hour. Or if you’re like me and don’t want to wait, place it in a bowl and microwave for 30-45 seconds. Add the Greek yoghurt, honey, vanilla essence and the lime zest/juice. Add the blended feijoa flesh. Mix together with an electric mixer, or use good old muscle power and whisk until well combined. In a mug, add the gelatine and boiling water. With a fork, mix together quickly and stir until all the crystals have dissolved. Add to the cheesecake ingredients and mix again well, until the mixture is smooth and well combined. Pour the cheesecake mixture on top of the base and smooth the top with a spoon. Place in freezer for 3-4 hours until set. Store in the fridge. To serve, top with coconut chips and slices of feijoa. Oh my goodness, this sounds and looks amazing!! I love feijoa season as well, I haven’t had nearly as many as I should have so far! Need to grab a bag or two to make sure I get my fix! This is a delicious$ nutritious recipe. I made the nut base, and only the first measure of honey in the topping. Thanks for sharing. I often find feijoa cakes heavy but this was a whaanau pleaser. Does the rolled oat base not need to be cooked? Hi Catherine, no it doesn’t need cooking.